This project is about connecting smaller farm-based biogas plants into a larger networked system so that larger amounts of energy can be produced. It saves on fossil fuel use, creates a cycle of energy re-use, and has created jobs. Reducing the use of fossil fuels and their negative effect on climate change is a major challenge for society. But it also presents opportunities – diversification into biogas production and use, business development, employment and a host of other positive spin-offs. Some farmers around the fertile farming area of Bralanda (1 500 inhabitants) in Dalsland County saw the chance to link a network of farms into a new local biogas production system. Three main objectives were identified for the project: a) to build infrastructure for biogas production from farm manure and crops in the Bralanda locality; b) establish a market for high-volume production of biogas of vehicle fuel quality to reduce the greenhouse impact from vehicles; c) develop the untapped potential of agriculture to raise the production of biogas for vehicle fuel and associated environmental benefits. The project connects small farm-based biogas plants into a larger system so that larger amounts of energy can be produced. 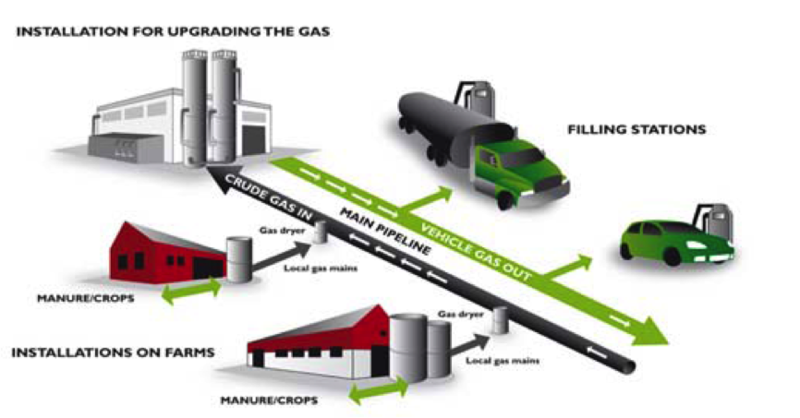 Technology development to enhance and develop biogas production adapted to farm level was the first step. This was followed up with training of partner farmers, and development of maintenance support services and investments in a demonstration plant. The first investment within the concept was made in 2009 and the first biogas production started in April 2010. In the first phase 25 farms were involved in biogas production. A model has been created on how to develop such a network, and documentation is available for dissemination. There is an action plan to start and operate production facilities at farm level to supply biogas for vehicle fuel and/or heat generation. And a plan for infrastructure construction of a main pipeline where existing biogas plants and local biogas pipelines can connect. Three businesses have been formed, and 5 jobs created. Make studies of the technical and economic prospects for biogas production, but also spend time and resources on “softer issues” such as business proposals, business plans, customer value and building trusting relationships. Some technical problems emerged during the implementation of the idea, but these have been solved through sound research and strong technological development.